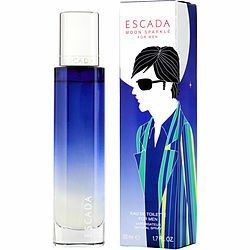 Escada Moon Sparkle by Escada is a men's cologne that suits men who have style and a casual nature. This fragrance was introduced in 2007, and its notes include pepper, violet, georgywood, vetvier, cedarwood, and bergamot, making it unique and refreshing. The mature scent has a moderate strength that won't overwhelm those around you. The fragrance is perfect for casual situations, whether you're headed to work or staying home. Vary user friendley to order on line, and was delivered in good time with the holidays and all,SAM I AM Graziano in Van Buren,AR.